I admit to being a kitchen snob. I do not have a Better Homes and Gardens budget but I do like the things in my kitchen to look nice. The kitchen is one area where I believe in using only high quality products and investing some time and money on design and functionality. 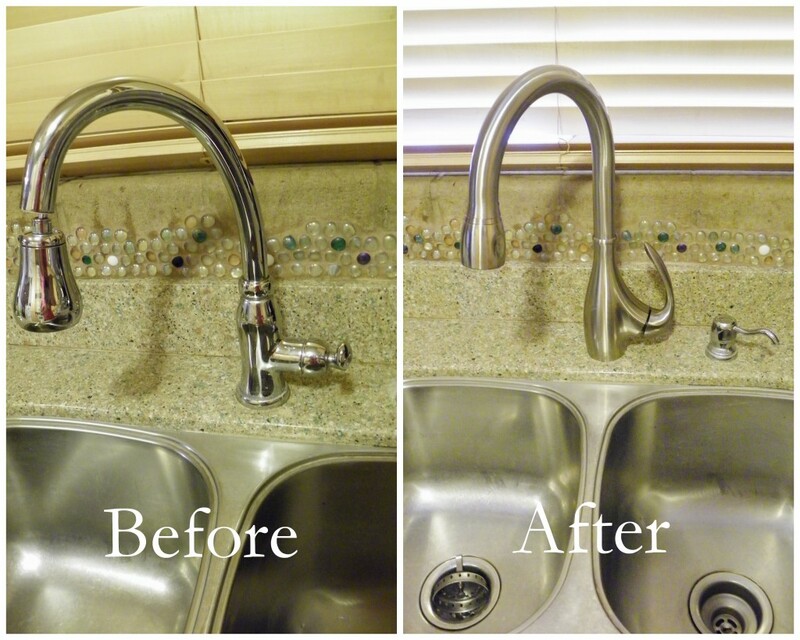 So when I got the opportunity to review a Danze kitchen faucet I got right on board. 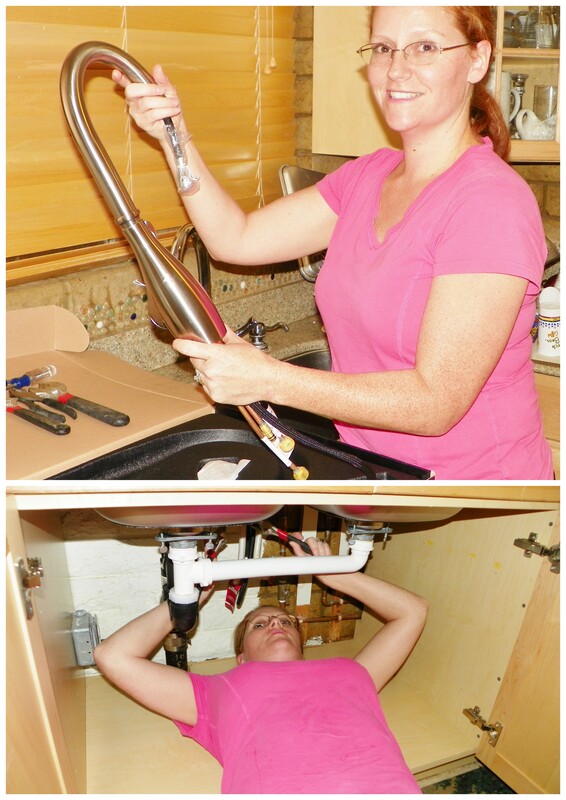 I recieved the Danze Bellefleur® Single Handle Pull-Down Kitchen Faucet. My old faucet still worked but the pull-down hose dangled and the water flow was not good enough. My husband installed the new Danze faucet without any difficulty. In fact, the installation was so easy that hubby let me help out a bit (see below). The new Danze faucet looks more regal and takes up less functional room even though it is bigger. I also like that the control arm glides effortlessly and that the turning radius is not cumbersome. My previous faucet came with a soap dispenser which the faucet handle constantly banged into because the turning radius was so massive. I kept the old soap dispenser installed so I was pleased to see that the Danze faucet comes nowhere near it when in use. One feature I really like on the Danze faucet is the twist control spray head. My old faucet had a rubber button that got stuck and I would always end up with a half spray, half stream mess. Also the spray head would hang down and not retract all the way. This Danze faucet changes from stream to spray with an easy twist. The hose slides out of the spout very easily and the spray head clicks up into place so it will not dangle. Overall I really like this Danze faucet. It is elegant, functional, and eye-catching. I also feel confident that it will last since it has a limited lifetime guarantee. If you would like to purchase a faucet from Danze, visit the Danze site to find a dealer near you. Or, if you would like to win the same faucet that I got you can enter the giveaway below. One lucky winner will snag the same Danze faucet! Good luck. Installation: so easy I helped! Disclaimer: I received my Danze faucet in exchange for my review. All opinions are mine. My faucet is old and outdated looking. So cool! My family would love this. I don’t find anything wrong. I would love to have one in my kitchen. mine is 30 yrs. old and it leaks a lot. Wish I could win this one. thx. I like that water comes out of my kitchen faucet although it is only a trickle. It seriously needs to be updated!! I love my faucet for the most part, but I hate that the spray splatters water all over! My faucet is old & not attractive ! i don’t like that it only streams and there is no hose if i need the water to spray. I hate the way it looks and it is old!! I dislike my current faucet because it is scratched and covered in mineral scales. I don’t like the fact that it often won’t stay in the stream form and switches to spray. It is so annoying. It drips and that we don’t have a hose of any sort to use. It leaks and splashes all over. There’s not very much space since my faucet is so low into the sink. My current faucet is ugly and out of date. I admit to being a kitchen snob as well. My faucet is due for an upgrade! My faucet is so low in the sink that I can’t put big pots underneath it. Plus it’s ugly! it’s outdated. I love yours !! Looks great / very modern ! I don’t like that my current faucet is old. It’s too short to get large pots under. my old faucet leaks and is oudated. mine leaks and is the cheapo Lowe’s standard. this one is pretty! My faucet is old and just doesn’t work that well. I dislike that I don’t have a sprayer and don’t have a clue how to add one. This would be perfect if I win! I hate that it doesn’t have a sprayer! My faucet was never installed properly so there is a lot of mildew all over the sink area. I’m hoping to renovate soon so this would be a great help if I win! This would replace a really outdated faucet……Thanks! Our faucet has terrible water pressure and has for years. We have had plumbers in several times with no luck. I would love to replace it, so that we don’t have to wait 5 minutes to fill a conatiner! I really love the Opulence™ Single Handle Kitchen Faucet with Spray. My kitchen faucet is blah…. Where do I start. Lol It leaks out the faucet when it is off and the on/off handle when uou have it turned on too high. Its falling apart and is unable to become clean from being so old. 🙁 I would lofe, love, love to win this giveaway! The dripping drives me nuts right now on the one I have right now..
My kitchen faucet leaks so much I can’t use it anymore. It is old and ugly! My faucet has started leaking and I need this very badly. I would love it. It is so stylish with a neat and clean look. I dislike that our faucet doesn’t match our cabinet nobs. my current faucet leaks water is is rusty brown! yuck! It gets clogged a lot. I don’t like my current sink and faucet because it’s outdated and I accidentally spilled acid and it has black spot everywhere. I can’t fill a water pitcher,that’s how short the faucet.I can’t put a filter on it,cause then it is uncomfortable to do the dishes,there’s a lot wrong with it. My old kitchen faucet is quite old and would like a stylish new one for when I replace my sink and counter top. Remodeling kitchen now. Interesting to learn about features of this brand. I have three bathrooms that I need to buy faucets for as well. This would be a great start for me to have this faucet in my kitchen. Thanks. It leaks at the base and the sprayer is weak. I hate that our current kitchen faucet is cheap and old. I really dislike the sprayer on my current faucet. Even with the water on full blast, the sprayer is weak and ineffective. Our current kitchen faucet is beginning to show its age. My faucet is to sort can’t get me big pots under them. plus it leaks. this is my third faucet in three years. can’t afford a good one. I don’t like the design of my current faucet. I dislike that it leaks. i dislike that it leaks all over the place! I dislike that it’s old fashioned, outdated and ugly! My current kitchen sink leaks, is ugly and old! I dislike that it doesn’t turn well. Our facuet leaks and you have to turn the handle a certain way to get it to turn off. My faucet sprays sideways a bit where it’s not supposed to. It always drips or leaks from the side when on full force. It is too low to the sink, makes filling tall containers difficult. 🙂 Thank you. I dislike that my faucet moves when you turn it on and it leaks and is outdated. Mine is old and leaky. I hate that It leaks!! I would love to win this to replace my shiny faucet that shows all the fingerprints. My faucet leaks and is getting old. Mine leaks! It got a hole in it somehow and squirts a small stream of water out of the top! I hate that mine leaks and does not move to easily clean dishes! I do not have a dish washer and wash all my hand! I would LOVE this!!! Mine leaks water at bottom and sprays in my face! I have to wear a bib to clean dishes! boo!!! I dont even have a workng one! I am working on that!!!! Mine is rusting through and has these tiny little leaks on the bottom. I actually love my faucet! I have a touch faucet from Delta, but they’re so expensive. Would love a nice one for our other kitchen, this one would be perfect! Right now, it needs some repair, since apparently the washers are pretty well shot. It’s just old! Also, we live in a trailer…and it’s the standard model that came with the trailer back in 1993. It’s small, plain, and old! My faucet leaks out of the side of the base and drenches the counters. I do not have a sprayer and it makes it harder to wash things. right now our faucet works fine but it doesn’t have a sprayer and i want one! That it is so ugly and outdated! Our current faucet in the kitchen is very blah and plain. It is old and outdated. Would like a faucet that has a knob that controls both the hot and cold water. What do you dislike the most about your current faucet? I don’t like that my current faucet leaks. It is old and leaks water. Ilike that the nozzle pulls out. It drips all the time and its ugly. It is old and the handle is lose. It must be leaking some because I notice wetness underneath in the cabinets-so I have a bucket under. LOL This was here when we bought the home and we have so much to do we have had to put a new one on hold because of cost. The fact that it’s 30 years old (original), is flaking off the finish, sprays all over us because the bottom of faucet needs to be fixed and the handles are loose and can’t be fixed. Other than that, it’s great! LOL! I can’t buy replacement parts to fix it! The thing I dislike most about my current faucet is that it looks corroded. What a lovely soap dispenser, and for a snobby kitchen faucet connoisseur, it’s not too bad either! And beautiful countertops as well.